"This is a basic white flaky pie crust, made in the food processor. The secret to good crust is to have everything very cold and to handle it as little as possible. Use frozen or almost frozen lard, butter, and/or shortening as your fat and ice water, and then chill the dough well before rolling. Process the dough as little as possible and use only the amount of water needed to allow YOU to form it into a ball, not the machine." Measure the flour into the processor with the regular blade attached. Add the unsalted butter, cut into cubes, and shortening, cut into cubes. (Your fat should be frozen or very cold. You may vary the proportions, or use some lard, but the total should be 9 tablespoons.) Add salt. Pulse three times with three counts per pulse to lightly mix the ingredients. With the motor running, pour ice water into the workbowl just until the dough just starts to get noticeably crumbly. Don't wait until it is a big clump or it will be way too wet and will turn out tough. Wrap your dough ball in wax paper or plastic wrap and chill it about 30 minutes in the refrigerator. Roll it out on a cool surface if you can. Then follow your pie recipe for baking. 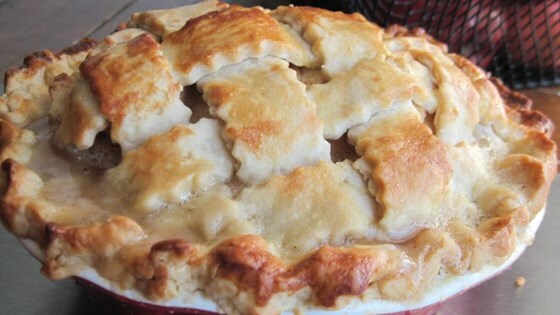 I was a pie crust failure, until I came upon this wonderfull recipe. It is so easy and makes everything you fill it with a huge hit! This crust is great! It's super easy. This was the first pie crust I made and it turned out perfectly! Just make sure to watch the water (I didn't use the whole 3 Tb.) and work quickly. EASY!!! Fantastic, tender, flaky crust! I used it with my favorite potpie recipe. I will use it again! Thanks, Charlotte.